The Thrustmaster 150 was released in September of 2015. It is a considered an entry level steering wheel at an affordable price point. This wheel was built to work with certain (but not all) elements of the Thrustmaster eco-system. It was designed for a realistic racing experience with Force Feedback which allows you to feel the road or track’s relief, loss of tire grip, braking, bumps and impacts, etc. This by far is the best PlayStation wheel priced at under $200 and is comparable to the TMX-wheel for the Xbox One. It has true force feedback, varying wheel rotation from 270 to 1080 degrees, and allows the ability to add a shifter and a pedal set with a clutch if you want to upgrade. This pedal set is the BEST choice for an entry level wheel and IMMENSELY out performs both the Hori 4 and Thrustmaster T80 wheels!. The T150 is also a great add on to the PSVR and will make for a much more immersive racing experience with games like DriveClub. Rim is 11 inches (28 cm) in diameter, plastic rim with reinforced rubber-coated grips, 270 to 1080 degrees of rotation adjustable on the fly, wheel resolution is 12 bits/4096 steps in the wheel, 2.5 inching (13 cm) metal wheel mounted paddle shifters, 13 action buttons (2 on the base) + a d-pad, force feedback with a mixed belt-pulley and gears system, brushed force feedback motor, two pedal set (throttle and brake), pedal resoltion is 10 bits/1024 steps, internal memory and upgradeable firmware, native PS4 compatibility where you can navigate user interface, works with the t3pa pedals and TH8A shifter. The quality of this pedal set for this price point is outstanding. I have logged over 100 hours on the T 150 and it has held up true to Thrustmaster standards. While the rim and pedal set do feel lite weight and a bit toyish, it out performs your perceptions. The wheel rim diameter feels good in your hands and the rubber grips help your hands stay on the wheel during force feedback. There is a quality to the force feedback that is similar to the higher priced T300. It isn’t quite as smooth and feels a little choppy at times especially under tight cornering, but overall it is decently strong which allows you the ability to really adjust your driving to how your car is performing. One of the best features of this well is the adjustable DOR, which is certainly handy to customize your racing preferences and change your DOR as you change the types of cars you race. The pedals are plastic and do leave a lot to be desired, but the good part about the T150 is you can upgrade your pedals later on. This is the best starter wheel for anyone, both casual racer and aspiring pro sim racer. This wheel offers the most options for the best price and should be seriously considered before purchasing a Hori 4 or Thrustmaster T80 wheel. If you are looking for an inexpensive PlayStation force feedback wheel this is your BEST choice. It has smooth, quiet, and decent force feedback which allows you to get a feel for the terrain and helps you understand how your car is behaving. While I do recommend this way to casual and semi serious console sim racers, this driving wheel will help you reduce your lap times and make your cornering more efficient. Another perk that makes this steering wheel and pedal set a great option is the fact that you can add on an upgraded pedal set with a clutch and/or a shifter (both sold separately). This means you can get this wheel and then grow with it as you decide to get more serious about your racing setup. With the price of this Thrustmaster wheel it makes it a really nice driving peripheral to add onto PSVR. With the VR headset on and using a steering wheel that offers real force feedback and vibration you get a much more simulated racing experience than you could ever imagine. Its a really awesome feeling when you are turning your head to look into the apex of a corner and your racing wheel is fighting back with you to straighten out your tires. 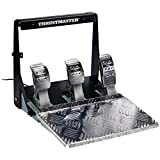 For a total of around $300 you can get the Thrustmaster T150 racing wheel and add the T3PA Pro Pedal set. This pedal set will add an adjustable progressive brake and a clutch pedal to your racing setup. 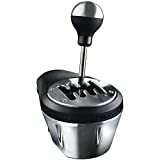 You could also add the shifter, but that pulls you into the $450 price range. I say start with T3PA pedals and build on later. 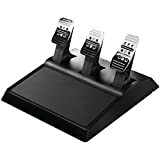 Adding the 3 pedals with the Thrustmaster wheel, creates more immersion, reduces your braking distances (because it comes with an adjustable conical brake mod), and quickens your lap times because you can set your game to use manual with clutch for certain cars. Overall this will give you a solid racing experience on your PS console and of course you can even use it on your PC. Works with the Thrustmaster TH8A shifter, the T3PA Wide Pedals, and the T3PA Pro Pedals. This wheel could also work with a T500 pedal set and with an after market adapter: logitech pedals or Fanatec pedals. Wheel is table and desk mountable only via a clamping system. The pedal set can be hard mounted with M6 screws to a chassis. 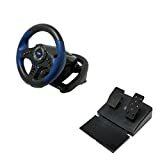 There is also 3rd party hardware adapter that makes the T150 mountable on anything like a cockpit or wheelstand. My best advice for any wheel is to hard mount it when you can, because table clamps always need to be readjusted after a few races. The Thrustmaster T150 Force feedback steering wheel is an unbelievable value for the price. While the pedals leave a bit to be desired, that fact that they are upgradable makes them acceptable. I also love that you can add a shifter. Driving with this wheel is extremely comfortable and the force feedback is smooth, quiet, and much better than a bungee cord system like other wheels. If you are looking for an entry level wheel on your Playstation or simply looking for a more simulated experience with your PSVR headset, then the T150 is worth a look. The T150 driving wheel by Thrustmaster is well reviewed at Amazon with over 40 customer reviews and an average of 4.5 stars. For the price, its ability to add components, how good it creates immersion, and the adjustable degrees of rotation, this wheel comes in at an easy 4 stars for PSRP! If you are looking to take things up a notch in simulation, you can checkout my #1 recommended wheel for Playstation4. Have your tried the Thrustmaster T150 Force Feedback Racing Wheel? Let me know in the comments.